So far in this series, we have discussed matters of tree care using the language of legal and insurance professionals. At the end of the day, they establish the basic responsibilities of the involved parties – which neighbor is at fault and which neighbor has to pay. In real life, however, by the time a situation gets to the point where we’re using legalese to talk about trees, the scenario probably could have been avoided if the neighbors had communicated with each other as good neighbors should. Generally speaking, there aren’t many tree care situations where communication with your neighbor is required by law. However, one example that definitely requires good communication would be a situation where the main trunk of a tree is growing directly on a property line. In this case, we would need permission from both parties before we can remove that tree. But even when it’s not required by law, maintaining communication with your neighbor throughout the process will produce the best result for you, your neighbor and the tree. Here are four ways that being a good neighbor can prevent costly property damage, strengthen neighborly ties and produce stronger, healthier and safer trees. It’s easier to prevent tree-related damage than it is to repair it. Avoiding tree-related conflicts and damage begins with being aware of the trees on your property. Listen to your neighbors if they express concern about a tree, its branches or its roots. Put yourself in their shoes and take the proper preventative measures. Legally, the damage might be entirely their responsibility (as described in Part 1), but it’s easier for everyone involved to mitigate the risk now and avoid the damage entirely. It’s more efficient to address tree-related problems with both neighbors onboard. When we have permission to use the property of both parties, the process is streamlined and less intrusive overall. We can show up, perform the work and leave both properties in better condition than we found them. However, if only one party is cooperating, then we may need to bring in special equipment and use creative techniques to complete the job, which can be louder, leave a larger footprint on the property and require significantly more money. If we can’t cross the property line to service the tree(s), then we are required to bring in larger cranes, higher-reaching aerial lift trucks and specialized extension tools. For us to take even a step onto the neighbor’s property we must have the neighbor’s permission. Permission granting access may come in electronic or written form. Cooperating with your neighbor produces a healthier and better-looking tree. As ISA-Certified Arborists, we take no satisfaction in flat-siding branches, but if they are growing across the property line, then it is technically within the neighbor’s rights to trim branches overhanging onto their property from ground-to-sky, back to the property line (especially if the branches are causing problems to the house as described in Part 2). However, if we are able to discuss the matter with both neighbors, we can find creative solutions that work for everyone involved – including the tree. 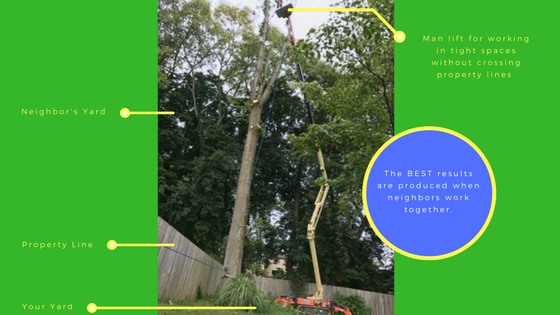 If we can work on both properties, we can reduce or shrink the canopy of the tree proportionally, and we can minimize many of the cuts that we are required to make. The result is that the offending branches no longer cause problems, and the tree retains its natural appearance while adding its unique value to the owner’s property. Choosing the best solution first avoids future problems caused by negligence. If the problem is that branches are dropping leaves that clog a neighbor’s gutter, or roots are extending into a neighbor’s yard and lifting up their sidewalk, an obvious solution may seem to be to cut the branches or roots back to the property line, but this option may cause more problems than good. ISA-Certified Arborists are forbidden to make these types of unhealthy cuts to branches and roots and would advise you not to so, as well. They will be able to offer alternative solutions to the tree problems. In addition to offering solutions, ISA-Certified Arborists can identify negligent tree care situations and, if necessary, provide expert documentation noting the possible negligence (as described in Part 1) if the neighbor owning the tree is unwilling to cooperate. However, if permission to work on a neighbor’s negligent tree has been denied, it is up to the property owners to work it out – or let the insurance companies work it after disaster strikes. You might not be legally obligated to contribute towards your neighbor’s deductible when a tree rooted on your property falls onto their house, but you should consider helping them out and contributing money because it’s the neighborly thing to do. Don’t let the tree get caught in the middle of an ongoing feud with your neighbor. I don’t care if you’re the Hatfields and the McCoys – the benefits of cooperation far outweigh the risks that come with butchering your neighbor’s tree out of spite. Trees and mortgages are both measured in decades and require long-term thinking and planning. Over the years, as neighbors, you’ll borrow cups of sugar from each other and your children will grow up together. If a tree is on your property and is creating problems for your neighbor, you should pro-actively take steps to address those concerns because you may be living next to those folks for many years to come.